THIS is the early morning image of the skies over Swansea which left an ex-soldier staring in amazement. 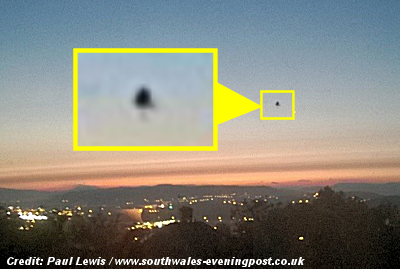 The photograph, which was taken in the early hours of Monday, shows a shadowy object hovering several hundred feet in the air, over Llansamlet. Witnesses say the object made no noise and soon disappeared. The photograph was taken by quick-thinking Paul Lewis, who snapped the object from the bedroom window of his home in Mayhill. . . .